Most flagship smartphone series get updated annually with improved technology and advanced features. Samsung releases its new Galaxy S models typically every year in March or April, while new iPhones arrive once a year around September. This annual premium launches apply to many other phone series as well, including the Huawei P, Xiaomi Mi, and LG G, to name a few. 2018 was no different, boasting a series of updated versions of phones launching throughout the year. Google launched the Pixel 3 and Pixel 3 XL, OnePlus had its two impressive phones – OnePlus 6 and OnePlus 6T – Samsung debuted with its Galaxy S9 and Note 9, and Apple’s iPhone XR, XS and XS-Max remained very much in the news. This wide variety of premium upgrades creates several options for users looking to upgrade to the latest smartphone. With the availability of shiny new gadgets promising premium features that make your not-so-old smartphone seem ancient, it’s understandable to see customers get enticed by annual upgrades all over again. However, you should hold your current smartphone for as long as you can if it’s not extremely old and struggling to keep up with the software. Annual upgrades are generally incremental. They hardly provide any extreme technological leaps when compared to their immediate predecessors. A button design change here or a bug fix there is hardly enough to support shelling out hundreds of dollars – or thousands – all over again. In most cases, a simple software upgrade will do the trick and design changes are hardly ever so visible, if they exist at all. In fact, smartphone users across Europe and America are holding on to their phones for longer periods of time. A recent report finds that, in 2016, consumers held on to their phones for about 22.7 months before replacing them. 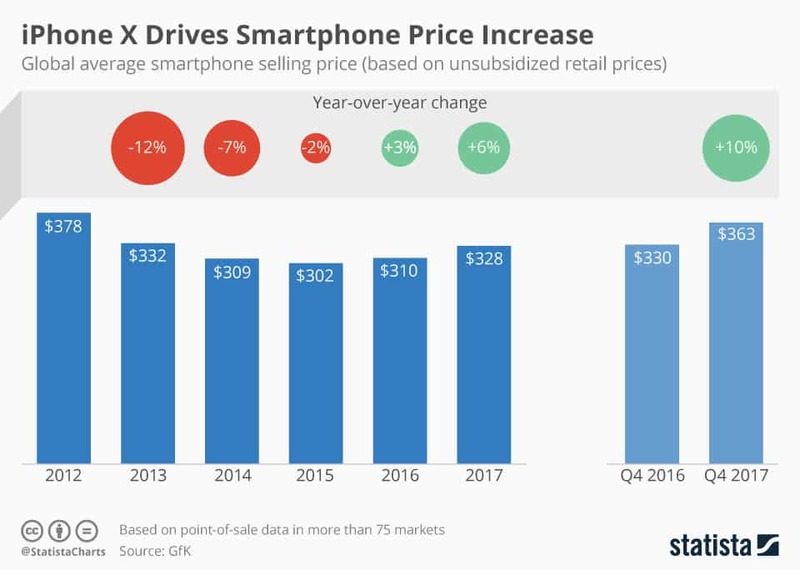 Further, Gartner, a global research and advisory firm focusing on IT (Information Technology) and other fields, reported the first year-on decline in smartphone sales in 2017 since it began tracking sales in 2004. The reason cited was that consumers are simply extending the lives of their smartphones, declining to fall for the lure of shiny new gadgets that hardly outpace their current handsets. 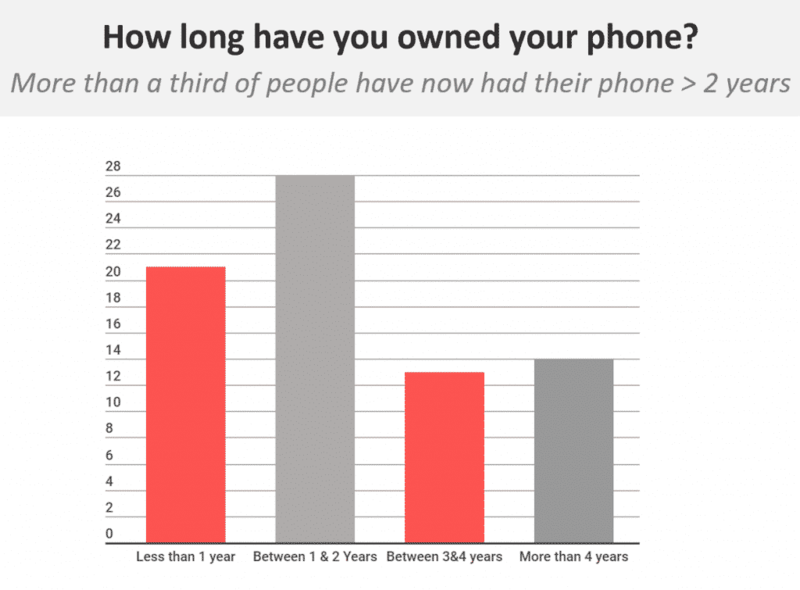 How long do people hold onto their smartphone? Following the latest trend of keeping your current smartphone can be the result of several reasons. However, the primary reason is usually economical, whether conscious or unconscious. Financial benefits stem from the avoidance of new, expensive purchases that seem unnecessary especially with the realization of how minute the changes made to annual upgrades can be. With claims of significant improvements in capabilities and performance, smartphones become increasingly pricey. In less than a year, a $1,000 smartphone has become quite normal, thanks to Apple’s 2017 release of the radically redesigned iPhone X with a radically high price tag of $999. Consumers, eager to own the highly-anticipated upgrade, lined up in stores to pay that exorbitant price — thereby signaling to smartphone manufacturers that high prices are acceptable. As if $999 wasn’t high enough, Apple priced the latest high-spec iPhone XS with 512 GB storage at $1,349 — 35 percent more than the iPhone X. In the UK, iPhone XS is available at £1,349 and AU$2,199 in Australia. The iPhone XR and XS Max are even more expensive. Samsung’s Galaxy Note 9, released in August 2018, joined the thousand-dollar phone club with a $999 price tag at launch and could cost up to $1,250. LG’s new phones – the G7 Thinq and V40 Thinq – started at $750 and $900 respectively. Google’s Pixel 3, with a starting price of $800, is $150 more expensive than the starting price of last year’s Pixel 2 model. The cost of the OnePlus 6T rose 3.8 percent over the OnePlus 6 phone released just six months ago, and a total of 37.6 percent over the last two years. Overall, the latest flagship smartphones will easily cost you more than $700. Adding the cost of insurance and accessory, costs could be close to $900 or perhaps even $1,000. If you are insistent on buying the latest iPhone, your starting price is $1,000. Carriers may advertise contract phone plans that include significant discounts on these prices, or even provide them for free in an effort to lure customers. However, consumers are becoming aware that such plans are expensive in the long term, amounting to costs that exceed the upfront price of these expensive phones. 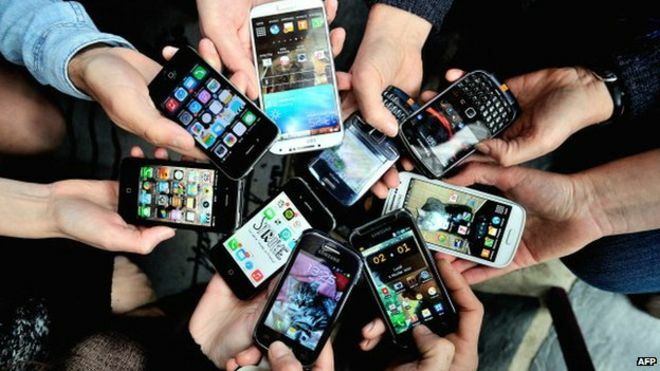 In fact, WhatPhone, reports that purchasing an expensive smartphone outright results in 25% savings over a 24-month span. Savings like these make consumers shell out cash for expensive handsets, regardless of their high costs. Holding on to your current handset for as long as you can is the best way to get around these overpriced smartphones. If you purchased a new mobile phone in the last two years, your smartphone is probably still in excellent condition. Also, smartphone chips released in 2016 are powerful enough to handle most tasks you expect from your phone. Performance issues with older devices can be fixed with something as simple as replacing the battery instead of replacing the entire phone. An old battery can also slow down the performance of a mobile device, and other fixes are available with a little research. If exorbitant prices are not an issue, purchasing the best available smartphone should be your goal. Note that most of the best, latest smartphones feature a notch on the top of the phone’s display that houses a camera system. Except for Samsung, the iPhone XR, XS, XS-Max, Google’s Pixel 3XL, OnePlus 6 and 6T phones, Huawei’s P20 Pro and countless others have notches. However, it is difficult to cite such minor design upgrades as improvements significant enough to warrant such high prices. In fact, notches are considered to be an unattractive touch. New phones are better, but not markedly better than they were a few years ago to justify their higher prices. Improvements are generally incremental, with minor changes to performance and software that can be simulated on older devices with a little research. There is hardly any need to upgrade annually simply because a new version exists. Fixes as simple as replacing the battery and general maintenance of your current smartphone, as opposed to an outright purchase of a newer version, can result in significant savings. Those savings can be used for an upgrade that truly lives up to the hype, when such an upgrade is finally required and available.